Due to chilly and cloudy weather conditions this morning, we made a last-minute decision to ditch the National Zoo (tomorrow’s entertainment, perhaps) in favor of some Smithsonian fun. As it turned out, we did an impressive amount of walking – I’d estimate about 4 miles. First stop, the National Museum of Air & Space. It was just as cool as my childhood memories of the place. Except with more interactive computers. And an IMAX theater, where we saw “Hubble 3D,” a new documentary recounting the story of the shuttle astronauts’ trip last year to repair the super telescope. It was terrific – the imagery just amazing. 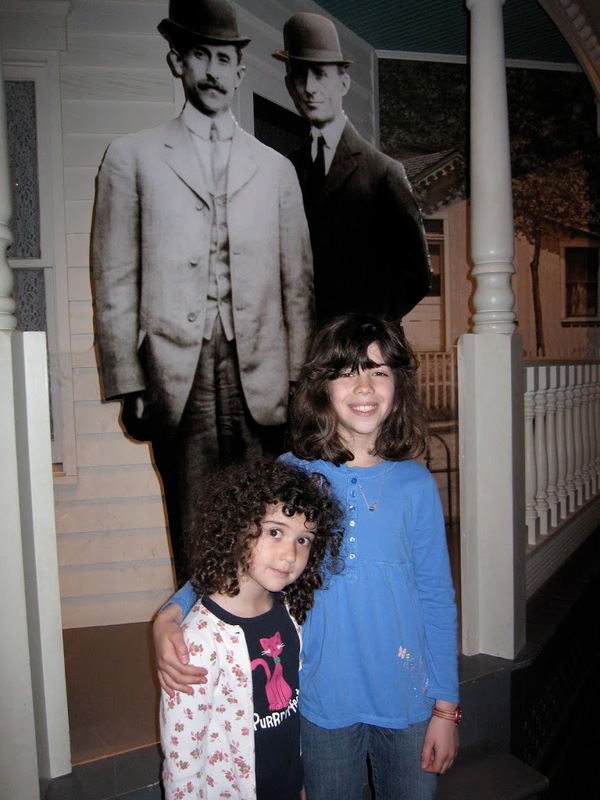 While at the museum, the girls had the honor of making the acquaintance of Orville and Wilbur Wright (see accompanying photo), saw the inside of a space ship and discovered how quickly light travels. After purchasing a boomerang at the gift shop, we made our way outside to the Mall in order to test it out. Didn’t work so well. Too much wind and too much cluelessness to master it. But boy, did the girls have fun. For the next hour or so, we slowly made our way – tossing the boomerang – toward the Capitol and beyond, destination: the National Postal Museum. Along the route, Chloe decided she wanted to give Sophie a piggyback ride. 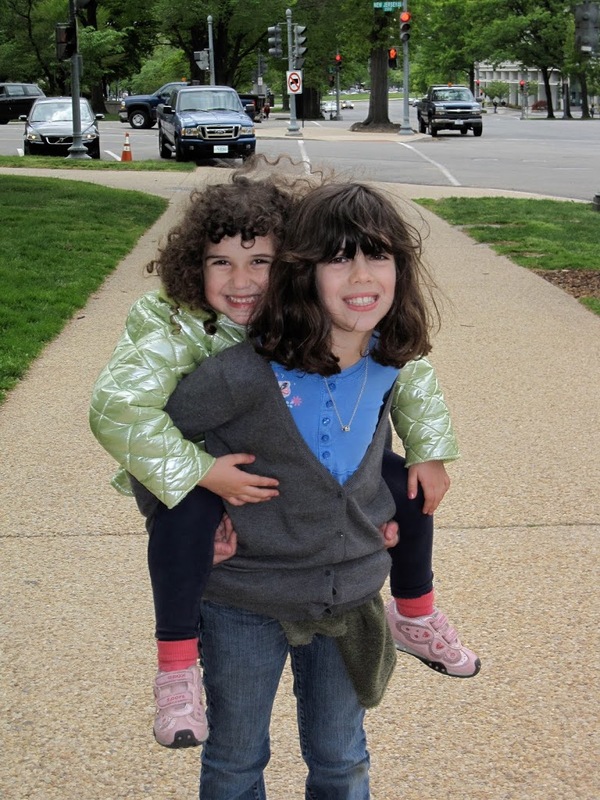 The last time Chloe gave Sophie a piggyback ride, Sophie probably weighed at least five pounds less than she does now. It was good while it lasted – all of about three minutes. We finally found the Postal Museum, a relatively new (1993) Smithsonian addition. In contrast to Air & Space, this museum was a lot smaller. And there were maybe ten other guests visiting it while we were there. 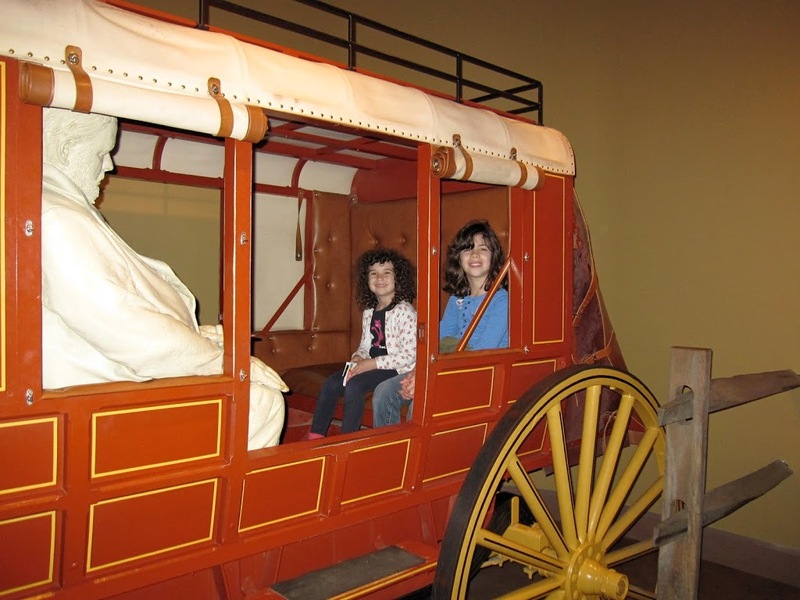 The girls enjoyed following the Boston Post Road from New York to Boston, learning about the Pony Express and playing amateur sleuths by puzzling out the mysteries that postal inspectors must solve. Chloe decided she now wants to start a stamp collection – so if any of you reading this have any cool stamps (U.S. or foreign, on envelopes or loose), please send them her way.